Spring is here and when most homeowners think of springtime, they think of spring cleaning and maintenance around the house. One item that homeowners should not forget to add to their home maintenance list this year is their air conditioning system. Pre-season air conditioning maintenance and upgrades will help achieve maximum energy efficiency and help save you time, money, and possibly a lot of sweat if something should go down in the dead heat of a Florida summer. 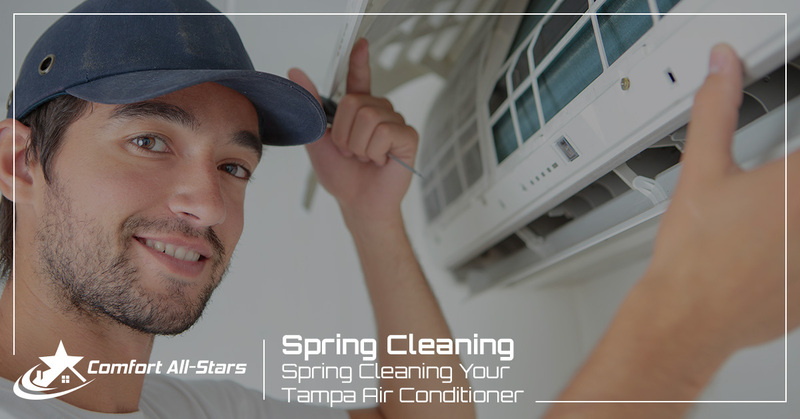 Below, our Tampa air conditioning technicians share simple ways to “spring clean” your A/C unit and prepare it for the warmer weather ahead. The simplest thing you can do is turn on your system to make sure it’s properly working, especially the air conditioning as you’ll be moving into the cooling season. Turn the air on for a while and ensure it’s cooling the house. The last thing you would want is to be stuck with a broken air conditioner on a day that’s uncomfortably hot. Leaves, twigs, dust, and other debris around the unit may be a potential problem for you in the future when it comes time to consistently using your air conditioning. Debris around the coils and around the perimeter of the machine can make it difficult for the system to reach the desired temperature and when it does, it doesn’t maintain the comfort levels. Keep leaves and other foliage out of your A/C unit to help ensure it runs properly. Having clean air filters is important to having your HVAC system work optimally. AC air filters protect your system from a buildup of dust and debris, plus they help improve the air quality inside of your home. HVAC professionals recommend that your AC filters are checked each month and replaced at least every three months to help keep the system and your air clean. Before the heat arrives, you’ll want to make sure that it has the proper refrigerant levels and that the openings are not restricted. Be sure to inspect the fan motor as well as the blades for wear and damage. Other items that should be inspected include the A/C compressor, tubing, hoses, and control box. These are some of the most high-risk areas for problems, so it’s important to make sure they are all in good condition. When the sun is out shining in Florida, the locals are heading to Clearwater Beach. If you’re like many people and plan to spend lots of time away from your home, then consider purchasing a programmable thermostat for your home. Programmable thermostats let you set different temperatures throughout the day, each day. When you arrive home your fun in the sun, your home will feel perfect. Preventative air conditioner maintenance is the only way to ensure that your unit will operate its best when you need it most! A well-maintained system will last longer and is less likely to require costly A/C repairs down the road. When you contact Comfort All-Stars to perform routine A/C maintenance, our technicians will inspect your system to ensure it is in the best shape and ready to help you stay cool in the hot and humid summer weather. Professionals say that air conditioners in Florida have a lifespan of, roughly, eight to 14 years. If you notice that your air conditioner is reaching the end of its life, or if you are constantly having to pay for A/C repairs, you may be ready for an air conditioner replacement. The springtime is the perfect opportunity to upgrade your air conditioner system to something newer. Modern units are not only more energy efficient but they also likely boast better performance than your existing unit. These are just a few ways you can get your air conditioner in Tampa ready for spring and the upcoming heat of the summertime. At Comfort All-Stars, our experienced technicians can ensure that your system is working right and in the best shape for the seasons ahead. To request air conditioner service, contact us today!